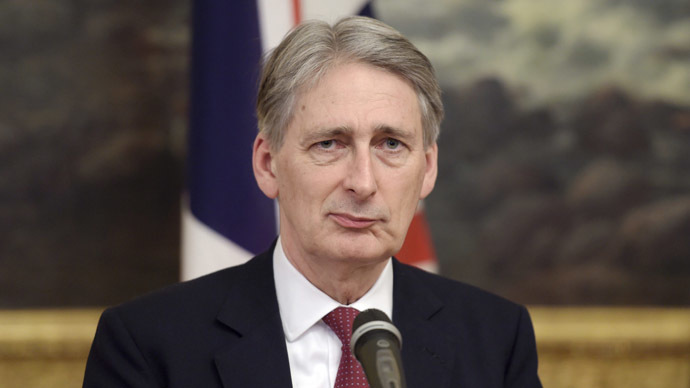 British Foreign Secretary Philip Hammond rejected calls for military intervention in Libya, insisting a political solution must be found to the North African state’s struggle against the so-called Islamic State (IS, formerly ISIS/ISIL). Hammond said on Thursday that efforts to install a national unity government will help Libya in its struggle against terrorist groups. His comments follow an appeal by Libya to the UN Security Council to lift its arm embargo, so it can counter threats from IS and other militants. Libya’s internationally recognized government currently controls only half the country. A rival government based in Tripoli claims to be the legitimate one. “The Algerian position and the British position are identical ... we believe in an inclusive political solution in Libya. “Efforts to empower Libya to install a national unity government will help its struggle against terrorism and prevent the [IS] terrorist group from gaining a foothold in Libya,” he added. Speaking in Madrid later that day, Hammond said the UN Security Council would not lift an arms embargo on Libya until the country had a unified government. “Simply pouring weapons into one faction or the other, which is essentially what has been proposed, is not going to bring us to a resolution to the crisis in Libya,” he added. Libya submitted a draft resolution to the UN Security Council calling for the arms embargo, which has been in place since the country’s revolution in 2011, to be lifted. Bernardino Leon, the country’s envoy to the UN, said he was hopeful a unity government would be formed soon. “The differences between the parties are not insurmountable,” he told the Security Council. Egypt’s Foreign Minister said he supported lifting the arms embargo following the beheading of 21 Egyptian Coptic Christians by IS militants in Libya. The Islamic State released a video showing the mass execution of the Egyptian workers who they had kidnapped and held hostage for weeks. Egypt launched airstrikes against IS targets in Libya on Monday following the video’s publication. Egyptian President Abdel Fattah Sisi called for a UN resolution enabling international forces to intervene in Libya. The North African state descended into factional fighting following the NATO-backed overthrow of Colonel Muammar Gaddafi in 2011. While two rival governments claim legitimacy, other militia groups have seized areas of the country. Before the revolution, Libya was one of the wealthiest nations in Africa, with the highest GDP per capita and the highest life expectancy.